There are plenty of commercials we tend to remember from our childhood due to their ostentatious or subliminal ways, but one commercial that always irked me were the I Can’t Believe It’s Not Butter ones. If you’ve never heard of the product, I’m sure you would’ve surmised by now that given the product’s title, it’s obviously margarine. These commercials stuck with you with sexualized hands–I honestly don’t know how they did it, but it was even obvious for 10-year-old me to understand the sexual innuendos–& this surprised husband who would eat his toast with what he thought was butter. Fast forward to today, it’s no surprise that margarine, which is made up of hydrogenated oils, is 10/10 disgustingly horrible for you. However, that doesn’t mean that the vegan butter you see at your local health foods or specialty store are margarine. Take a gander at the ingredients list & if you don’t see anything with “hydrogenated oil,” or even partially hydrogenated, you’re okay! So, why are hydrogenated oils so bad for you? Well, you could take a general chemistry class & then an intro to organic chemistry class to fully comprehend it, but the quick & dirty explanation is simple: hydrogenating oils means adding a hydrogen molecule to a molecular structure, making it more stable at room temperature after intensive science (adding metal catalysts, intense heat & pressure being added, etc). This new molecular structure is often compared to being similar to plastic, especially because the process increases shelf-life. Unless it’s honey, food should always eventually rot. But, what does all of this mean? Not very pleasant things for your body, so avoid it at all costs. However, that’s where some of the other alternative vegan butters come in such as Earth Balance, Nutiva, & SmartBalance. 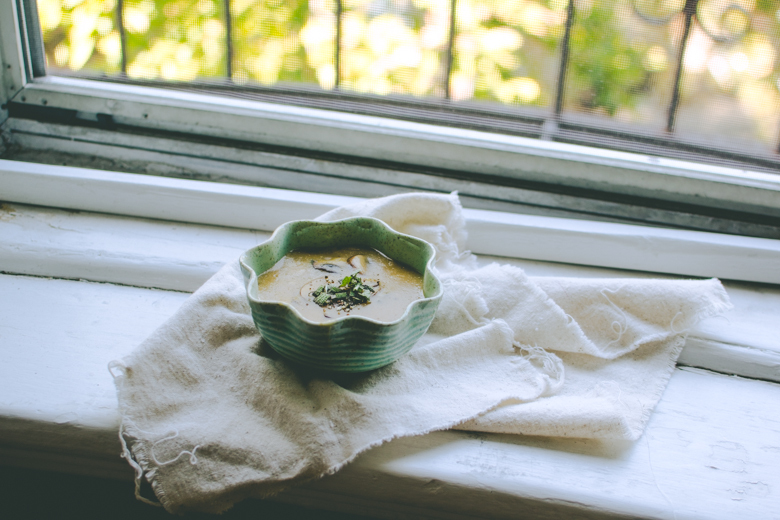 In fact, I decided to change it up from Earth Balance & tried Nutiva for my two recipes. If you’re looking for an animal friendly product, search for some of these brands in the grocery store & you can get to cooking tons of vegan-friendly food without even realizing it! These two new recipes I’ve just added are absolutely perfect for the holidays & are vegan-friendly. Now onto pictures of my fancy mashed potatoes & gravy. For the past 3 years, I’ve made mashed potatoes for Thanksgiving & Christmas for my family. However, I always relied on a powder mix to make the gravy. This time around, I’m bringing you two new deliciously vegan-friendly recipes with a bit of a gastronomical flare. Add microgreens or edible flowers to this dish to dress these potatoes up or just keep it low key with some phenomenal gravy. Be sure to check out my recipe to recreate this simple side dish! Look, if you’re not a fan of mushrooms, it’s time to become an adult & start actively eating more maturely, thus moving beyond eating mac n’ cheese or anything else within your comfort zone. You’ll never develop a good palate if you continue to eat like you did in your childhood, so expand your mind & get over the fact that mushrooms are fungus. Your mouth has hundreds of thousands of bacteria, but you still swap your saliva with someone when you kiss them. Your skin? HAH, crawling with bacteria. Cheese, milk, ice cream, & yogurt = b-a-c-t-e-r-i-a. Please remember that mushrooms need love too, okay? It hurts their feelings when you say you hate them. So, get over your strange abhorrence for them because of “texture” & just enjoy them. They’re delicious, nutritious, & absolutely healthy for you. 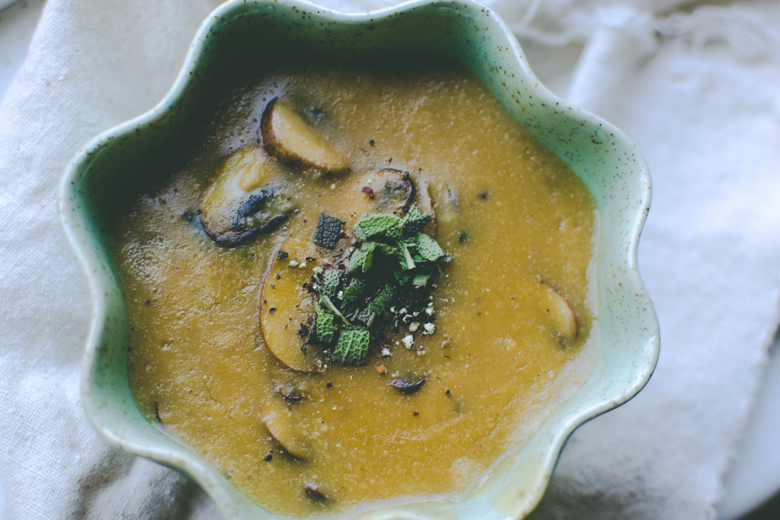 I’m not saying you should show them you love them by eating them straight out of the forest–please, please don’t do that, some are actually poisonous–just try my savory Mushroom & Sage Gravy recipe to help you transition into adulthood. Some foods are love at first sight while others take a little bit of getting used to. You’ve only so much more to gain from falling in love with these incredible fungi, so give it a chance. They’ll never break your heart. Also, my recipe is perfect for vegans, vegetarians, & meat-lovers alike. It’s delicious with biscuits, mashed potatoes, veggies, steak, or whatever else you eat gravy with. Major Acknowledgement: I Love SORTED! If you’re following me on Tumblr or on Instagram, you already know that I was featured on SORTED’s Foodie Spotlight! I’ve had a few of my photos reblogged hundreds of times & gained no followers nor hits from Tumblr, but when SORTED gave me a shout out, my website blew up. My stats were off the charts! I’m so grateful to their gratitude & their appreciation of their fans. Be sure to watch the guys on YouTube for entertainment & some recipe inspiration! P.S. it’s completely normal for you to suddenly begin to develop crushes on all of them due to their British charm & their culinary skills. Just let it happen. Maybe even let it go? Ahh! Everything looks so yummy! I’ll admit…I’m not a mushroom fan. And it’s not that I don’t want to like them, the taste of them just don’t appeal to me. I have forced myself to eat other veggies I know I didn’t like as a kid and came to love them. Broccoli, onions and asparagus but I can’t seem to like the mushroom. Although, your ranting/strong-arming may have shamed me into giving them another try. Also, Smart Balance is my choice “butter”. I’m not a vegan but I love how light it is. Haha, if you’re not a fan of the taste, I wouldn’t adventure to eating anymore unless you’re determined to have them grow on you. Most of the people I know that don’t like mushrooms simply despise it because of its “texture,” but don’t mind its taste at all. It’s really reminiscent to an earthy meat taste soooo I mean, if that’s not what you’re into, don’t force yourself. Bahaha I tried to be humorous about it. I just get thoroughly annoyed when people complain about “texture” as being the reason why they don’t like something even if the taste is great to them. It’s not a great excuse to me. I get it, texture & taste are big components into the overall appeal of something, but my goodness, you just gotttta get over it. I’m glad I almost never use “fake” butter in homemade foods unless some restaurant uses it for their dishes. Your food always looks extra delicious! I suddenly want some mashed potatoes, haha. Mushrooms are delicious! What kind of mushrooms do you use? I’ve seen the other mushrooms from your other posts. I have some of those “skinny mushrooms” in the fridge along with shiitake in the cabinet. Congratulations on getting the promotion! Your hard work is worth everything :D! You should always stay away from margarine, but the healthy alternatives from SmartBalance, Earth Balance, Nutiva, etc use non-hydrogenated oils so they’re not margarine. Much healthier for you in terms of cholesterol content! Natural ingredients too instead of processed milk! 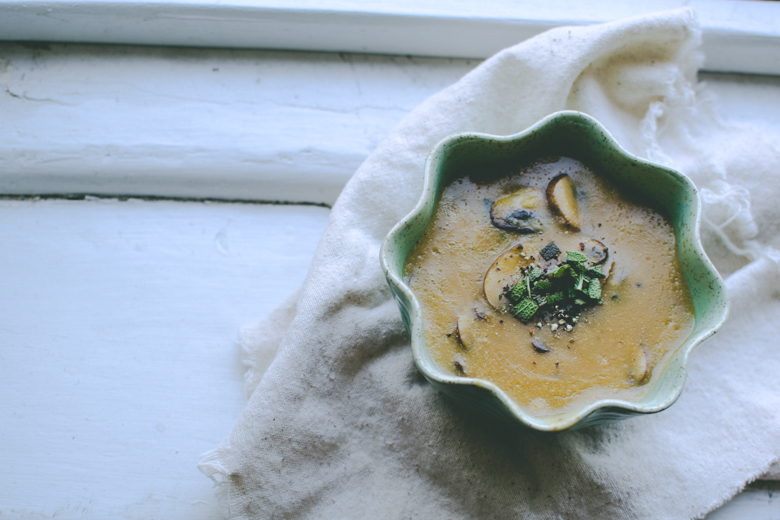 All of my recipes explicitly state which kind of mushrooms I use, you just have to click on the recipe link to find out. I think the “skinny mushrooms” you’re referring to are the enoki, correct? The ones that look like little noodles? Congrats with the feature! You and your delicious food deserve the shine. I have to admit that I’ve never seen any of those commercials, but your description of those sexual hands made me feel like my childhood is missing something. I’ve only recently noticed that I eat a lot of butter, which might not be very healthy. My household used to only buy this one brand of butter that was rock hard in room temperature, which made it impossible to smear and would shred your slice of bread in pieces, but ever since I convinced everyone to switch to another brand that is soft in room temperature (because it’s “80% butter, 20% oil”, I’ve been having butter almost daily. Never tried margarine, though. After what you wrote, I’m not very tempted to try it, thankfully. And gravy! I’m a sucker for gravy. It’s the best part of any meal. It completes it. I grew up with powder mix gravy, so homemade gravy made from scratch is a luxury. I might have to bookmark your recipe. 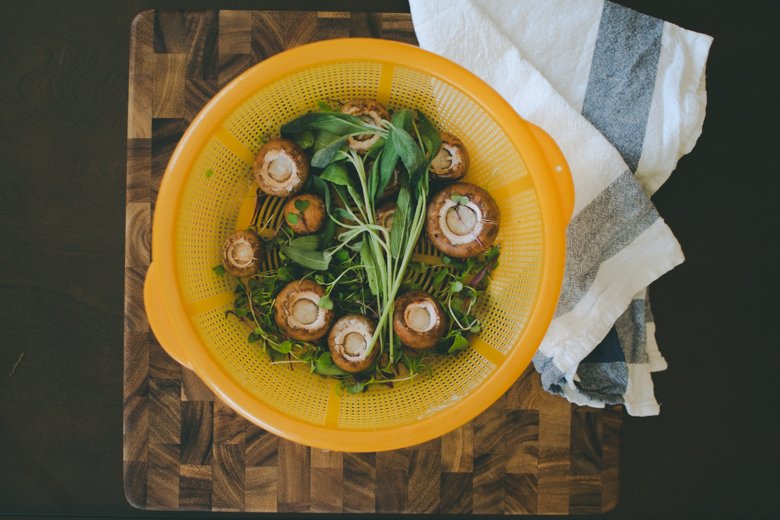 As for mushrooms: They do feel like grown-up food. 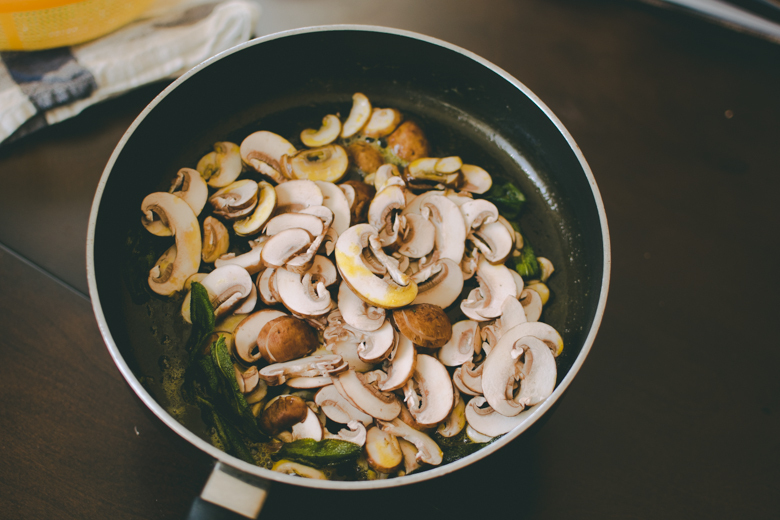 I wasn’t a fan of mushrooms until I was fed champignons on a regular basis and eventually got used to the taste and texture. Tried chanterelles once – never more. But your little “speech” was very convincing (and amusing!). You’re a very charismatic advocate for mushrooms. Your childhood was definitely missing out on them sexual hands. I tried to find a YT video of one I remembered from my childhood, but I just simply couldn’t finddddd it. Sigh, but you’ll just have to believe me for now bahaha. Well, make sure that the oil isn’t hydrogenated because if it is, then you’re pretty much eating margarine & not really knowing it. Even if it’s partially hydrogenated, just stay away from it. Use real butter or the healthy & natural alternatives. 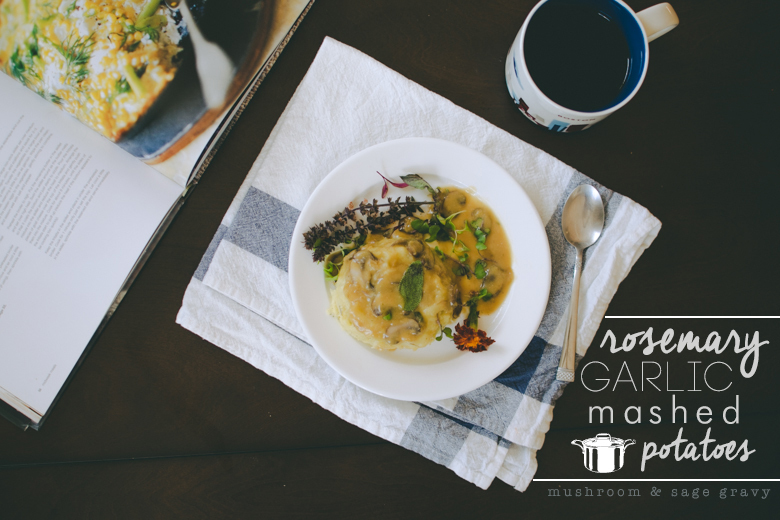 I hope you try out my mushroom gravy! It’s seriously delicious. So much umami flavor to it because of the mushrooms. 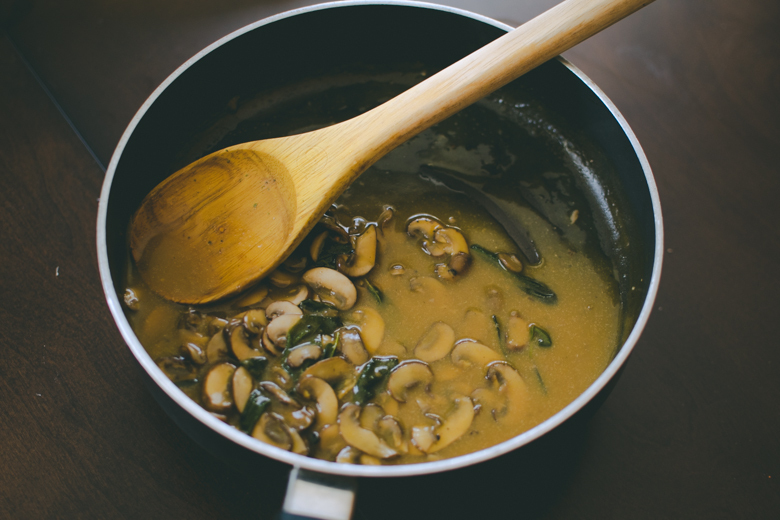 It’s really difficult to hate consuming the mushrooms when they’re sliced so thinly & barely noticeable in the gravy. I’m glad you enjoyed my advocacy for the love of mushrooms. Mushroom whisperer maybe? Hah, not. I can’t even grow the mushrooms from my mushroom farm my boyfriend got me. 🙁 Never tried chanterelles. They’re kind of expensive every time I see them, but I love all mushrooms so I’ll probably give it a go. I’ve always been a huge fan of mushrooms. I don’t discriminate against food, unless I try it a couple of times, and end up just not liking it. Every time I order pizza, one of the necessary ingredients on it, always has to be mushrooms! I’ve never made gravy from scratch before. Just curious where can I buy sage leaves? I’m not sure but I don’t think I’ve seen them at Trader Joe’s or any of my local grocery stores. Thank you! I love mushroom pizzas! They’re my favorite kind of pizza, so when a pizzeria messes it up with canned mushrooms, I’m just not a happy camper. How lazy does a pizzeria have to be to not want to slice mushrooms?! Sage is in every single grocery store. It’s in Trader Joe’s, Whole Foods, Albertson’s, Von’s, Ralph’s, etc. Just go to the herb section & you’ll find it. At Trader Joe’s, just ask one of the employees & they’ll point you to the section where they keep rosemary, parsley, cilantro, & other herbs. & thank you! I got my friend to watch their videos & she’s in love with all of them, but also majorly in love with Mike & Barry. How can you not be, right?! I know! I hate it when I get a pizza and they mess up on the mushrooms. What I usually do is get half of my pizza with jalapenos, and half with mushrooms, and onions. Seriously I’m a veggie lover. I just saw on Claire Marshall’s instagram that she got to work with Barry and Jamie! Can’t wait to see what the three of them come up with! I’m very thankful to have a family that incorporated vegetables into my diet when I was young. You don’t find kids nowadays eating vegetables; however, my boyfriend’s grandfather’s grandkid Wyatt, is eating vegetables and he loves them. He’s 5 years old! I couldn’t believe it when I had seen him popping cherry tomatoes in his mouth! I encourage this. Mushrooms are absolutely delicious. A friend of mine actually got me to put a lot more vegetables on my pizza when and if I had one. One time, I made turkey jumbalaya or however you spell it, at my apartment and it was a Weight Watchers recipe to use Turkey instead of regular meat. It was delicious. I had leftovers and used it on a pizza with a lot of vegetables, and I loved it. I’m actually kind of confused about the ingredients in most food labels. My apartment manager was notifying me about the bad stuff in the foods, and told me that I should go to Sprouts. However, I only had about $100 for the rest of the month to live off of. I’ve heard that Sprouts is ridiculously pricey, and I can understand why. All organic. I would NOT mind going there when they have sales or something, but I never got over there except one time, and that was to rice cakes (and not everyone loves those). I love the flax seed rice cake and one other kind. I can’t recall what the name of it is. Anyways, she was telling me that I should look at the ingredients, but I haven’t the slightest clue what to look for. I’ve always thought that Country Crock was butter and the sticks were butter. That’s when I was younger. I still don’t get the difference in either. You’re making me want to try your recipes more and more. Hopefully, I can someday soon. That doesn’t really surprise me to be honest! Mothers who were planning on having children tend to read up on how to raise your kid to not be a little snotty brat. Sure when they deal with certain situations they just “wing it,” which drives me up the wall, but when it comes to nutrition, a lot of people realize how important it is to raise your kids on a healthy diet. With obesity on the rise, it’s a concern to most parents (it should be a concern to EVERY parent, whether they’re genetically predisposed to it or not). We’re both lucky we grew up eating our veggies (I certainly never complained about eating any), but others….not so much as lucky. Jambalaya is a great meal! You end up with so much that you’re pretty much set for a week & a half. I have a Seafood Pan Roast recipe that’s similar to jambalaya, but if you want to cut the cost, it’s probably best to exclude the seafood & use turkey or no meat at all (meat can be expensive whether it’s seafood or land animal). The whole point of grocery shopping is that it should be easy. Buy things with ingredients that are simple. Since I try to avoid vegetarian versions of meat products because they’re overly processed, I get tempted to look at some. I went to an Asian grocery store yesterday & saw some “soy nuggets” for about $2. Looked at the ingredients: wheat gluten, soybeans, water, calcium sulfate, salt. Calcium Sulfate (CaSO4) is used as a coagulant for tofu, which is perfectly fine. Ingredients are listed in descending order, so if you look at soda, the first ingredient is often high fructose corn syrup, which means there’s a higher ratio to HFCS to water. Pretty disgusting. Also, drinking a lot of soda that’s not the natural healthier ones, can lead to osteoporosis. Nobody wants that. I love Sprouts! It’s a lot cheaper than Whole Foods & their produce is great! I don’t think it’s ridiculously pricey. I mean, it’s pricier than Trader Joe’s, that’s for sure, but it’s not as pricy as Whole Foods. Whole Foods……..I love it, but it’s just obnoxiously priced. Which is frustrating because it’s the mecca of health foods & those that SHOULD be healthy simply can’t afford it, which is why McDonald’s is so appealing to people who just can’t afford to eat healthy. Healthy food should be cheap, not expensive. If only the unhealthy foods in this country were more expensive…. Like I mentioned before, try going to an Asian grocery store for cheap produce. Yes, it’s kind of foreign, but it saves you tons of money, especially when you want to buy a bag of onions or garlic. My mashed potatoes recipe is really cheap, especially if you have a bag of potatoes at home already. If you don’t, they’re only about $2-5 & you’d be able to make tons of other recipes using potatoes. This is why I also tell people about the amazingness that is Trader Joe’s! They have a lot of really great affordable ingredients. All their spices are $1.99 with the exception of saffron ($5), but it’s so easy to just stock up on the spices. They’re an investment upfront, but they’re worth every penny because their shelf-life is so long & they enhance all your meals! They have pizza dough for… $1.99 I think & the sauce is around $2.99 or so. Then add your veggies! 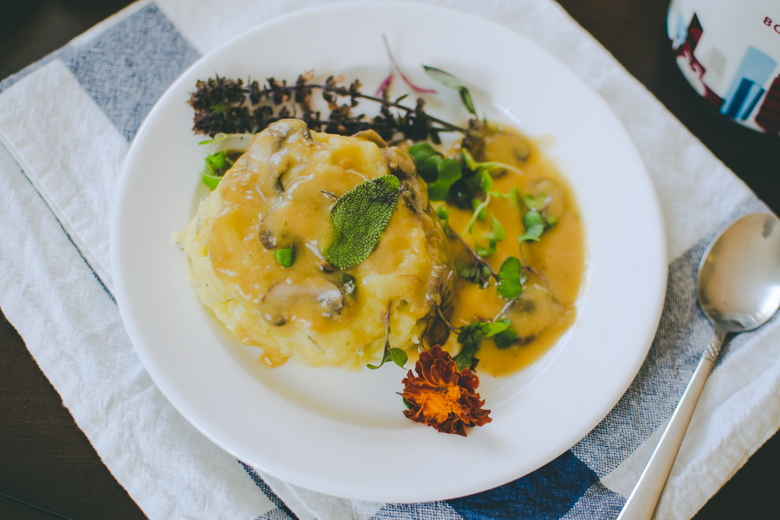 You can add your extra mushrooms to it from the mashed potatoes & gravy recipe. As for the margarine, I did just explain the difference in my post, so you should understand the difference by now! Margarine = bad. Butter from Earth Balance, SmartBalance, Nutiva, etc = good because they don’t use hydrogenated oils & also, they’re vegan, healthier, & just as delicious as the real butter. Also, much lighter. Also, made with natural ingredients. Also, no processed milk was used aka perfect for lactose intolerant individuals. Mashed potatoes is one of my favorite foods! I leave some of the skin on when I make them too. I feel like having some texture in the mushiness is nice 🙂 The gravy also looks awesome, especially since I love mushrooms. My father-in-law is one of those people who are grossed out by mushrooms because they’re fungus. Since my husband grew up with that thinking, it took him a while to finally eat mushrooms (and he didn’t eat them until he met me). Beautiful post, Tiffany. I enjoyed learning about hydrogenated oils. We don’t need a PhD to know what we are really eating, we just need to know a few facts and read the ingredient list. The mashed potatoes gravy is fantastic too. I’ve got guests for dinner, luckily for me they can eat mushrooms. I look forward to trying this delicious vegan gravy. Congrats on your Sorted Feature! I’m so excited that your blog got even more shine! Your content is always amazing! 😀 This recipe is so me. 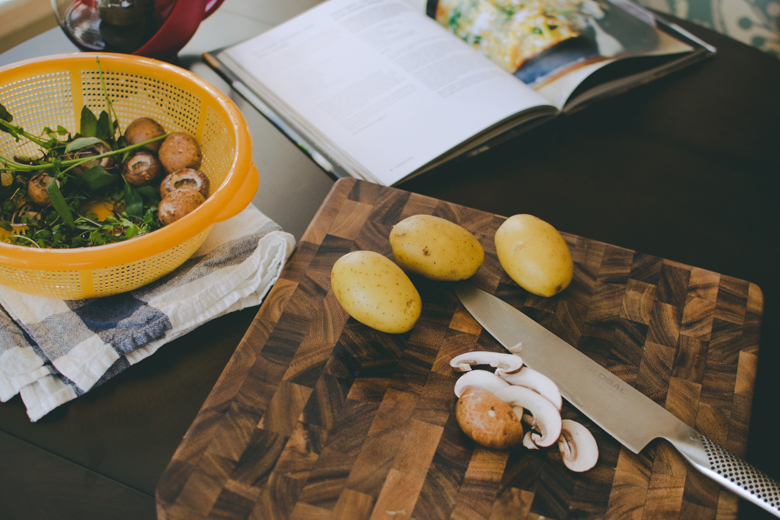 Potatoes are one of my favorite things on this earth and your recipe sounds divine! I can’t wait to try it out! I hope you’re doing well! Thanks, girl!! 🙂 I’m so flattered by your kind words. Hope you try it out! Remember, if you want more creaminess, add more butter hah! 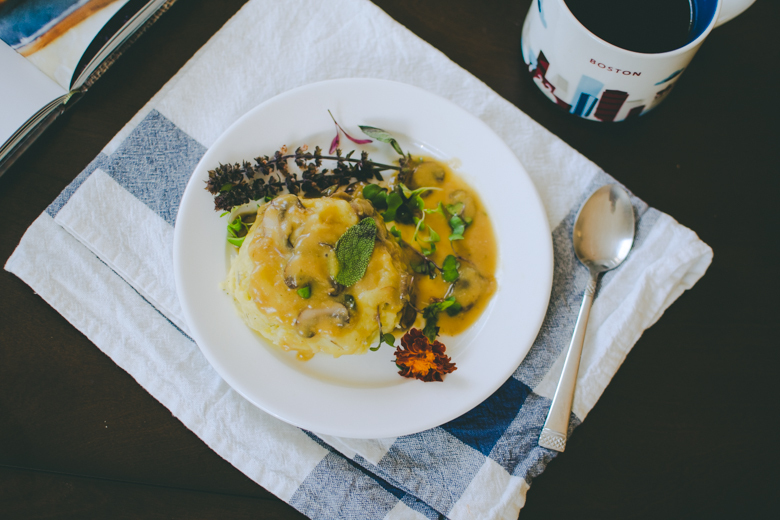 Or use heavy cream for your mashed potatoes…but the point is, I wanted to make a vegan version haha. HAH you & me both, woman!! Hilarious. I stuff them in secretly into my boyfriend’s meals. He never really knows until after I tell him. I think he’s slowly coming around to it. Just know that our sneaky mushroom stuffing is truly making better people hahaha. Thanks, Jolene! Let me know how it turns out if you try it! Nutvia uses coconut oil & red palm so it’s kind of this really bright yellow color. I originally bought it because it was cheaper than Earth Balance & I wanted to try something new myself. I like it, lots of bang for your buck, but I think I prefer Earth Balance. Or do I? I don’t know, they’re all great to me! i honestly felt like taking notes for that short introductory lesson about oils you did there. some people argued that margarine for bread spread is better than butter, others oppose this idea. whatever the truth is, when i tried margarine on my bread once (because i ran out of butter), it tasted disgusting. super oily, super fatty, really nasty. my lips felt like they’re drenched in jelly collagen or something, ewww… i’m seriously wondering what made me use margarine at that time. that was stupid. i’ve never seen vegan butter sold here. i wish it is. i’d love to try it on my bread LOL i swear going to grocery stores always make me wanna try different brands on the same stuff. like doing a fun experimental trial and error. i can’t believe anyone who’d hate mushroom!! LOL i’m probably gonna start pointing fingers to people if they say they hate mushroom but like the taste of mushroom dressing or sauce or whatever along that line. i think i knew someone who said she doesn’t like eating mushroom but likes the taste of, say, mushroom sauce for the steak. THAT’S REALLY WEIRD. UGH. i’m seriously laughing at your little scolding there and about the mac and cheese as well. is it true that americans like mac and cheese for their dinner? my friend who used to live in the US told me that – that americans can’t seem to stay away from mac and cheese as well as bacon LOL it’s like… bacon is their life or something. i personally like mac and cheese but i don’t eat it often. i bought this instant mac and cheese from kraft once and it was good for like a once in a blue moon meal. not gonna buy that often though because instant food = bad. also, cheesy stuff = fat. yeah i’m that paranoid, man. my mom has this recipe to deep fry shiitake mushroom and it makes such a good snack i love it. i know deep fried stuff is bad but yeah, good snacks TvT still, i like mushroom in general (though enoki ones can be annoying since they easily stuck between teeth). ugghh congrats on being featured, you amazing human with ahmayzing blog TTATT how envious~ haha jk. you deserve the attention! Hah well, the truth is: use real butter. Don’t use margarine, ever. Bad. Just bad for you. Your mom using margarine instead of butter in her fried rice is kind of… interesting, but I know a lot of restaurants use margarine instead of butter because it’s cheaper & also its flavor is kind of amped up. Hydrogenated oils = bad. So, stayyy away. But I try to stay away from butter because too much of it is bad for you, so I use the natural plant butters instead. 🙂 Did you know you could make coconut butter just by putting unsweetened coconut flakes in a food processor? Yep. That simple. For the caucasian Americans, a good chunk of them love their comfort foods: chicken wings, mac & cheese, pizza, spaghetti, & the like. Mac & cheese has a long history & origins in Europe, but you’ll often see mac & cheese on menus at New American restaurants in which they will top the mac & cheese with bacon as you mentioned, or lobster, or some other meat to spice it up a bit. I’ve had one topped with Hot Cheetos before (absolutely delicious by the way). While some like to stick with what they know because they’re boring, they will cling to mac & cheese over trying that new Indian restaurant. I satirically threw the mushroom haters under the bus because I associate those that don’t like to move out of their comfort zone like food that’s also sold in a box by Kraft, but Josh eats all sorts of food. He just needs a proper brainwashing to like mushrooms, but I’m up to the challenge. I told him it was my goal to get him to like it & he pretty much thought it’d be impossible. Now he’s eating mushrooms without a fit of disgust. I win. 😀 I like mac & cheese, but like you, it’s not something I could every single day..it’s just cheese, milk, & pasta……I can’t even eat carbonara everyday! Fungus & bacteria are completely different, but people fear fungus more than they do bacteria. Fungus is more closely related to us than it is to bacteria, so people feel it’s more disgusting than bacteria. You certainly never see bacteria form into little mushrooms in your bathroom! It’s got a bad rap! Yeah so what if mushrooms grow in the forest & can kill you? Some of them are edible & they’re such an amazing source of nutrition! They have all these amino acids that you normally can’t get from other plants. Fungi are pretty damn cool.